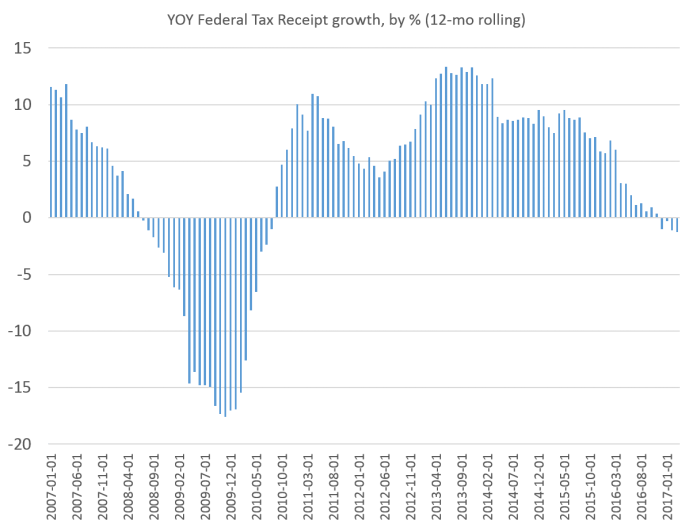 A new report from the US Treasury Department shows that growth in federal receipts has fallen to the lowest level seen in 80 months, with the 12-month average falling 1.3 percent from March 2016 to March 2017. The last time federal receipts fell as far was during July of 2010 when they dropped 2.4 percent from July of the previous year. More importantly, the last time receipts fell this much, while in a downward trend, was in July 2008 shortly before the financial crisis. March 2017 was the fourth month in a row during which federal receipts were down year over year, while growth rates overall have been falling quickly since mid-2015. 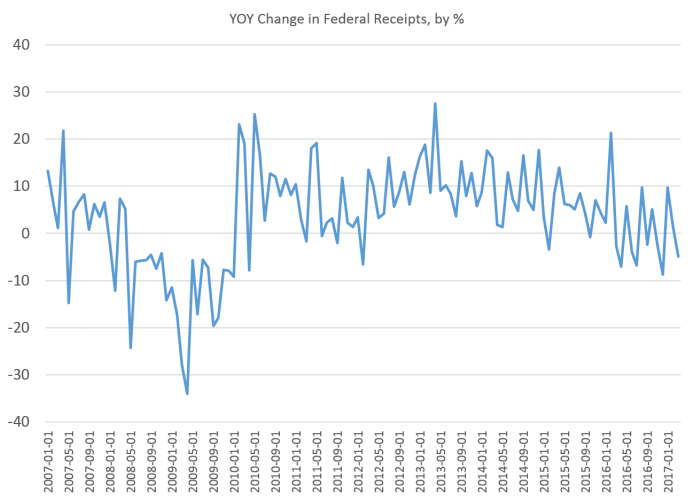 If we remove the rolling averages and simply look at straight year-over-year growth, we find that growth rates have been bumping along near zero percent for the past year. By this measure, the overall trend has been downward since mid-2013. This isn’t to say that the federal government is hurting for revenues, of course. Through mid-2015, the feds were pulling in record receipts, and only over the past year have receipts begun to flatten out. Nevertheless, they remain above pre-recession levels. So why is this trend important? 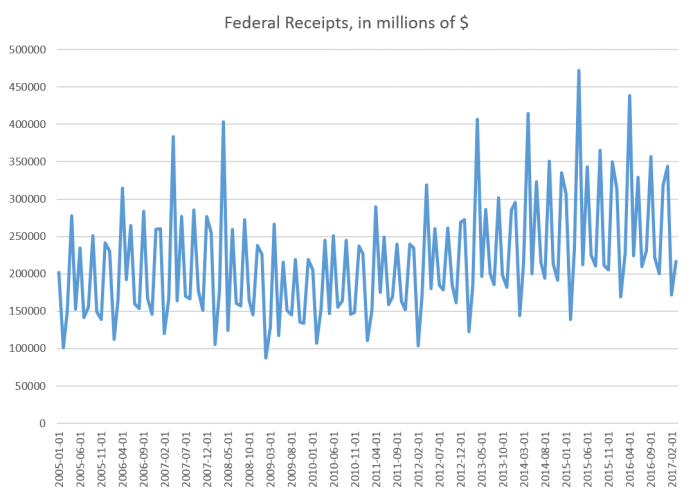 Going back decades, we find when receipts turn from positive to negative, the US is either about to slip into recession or is already in recession. Declining federal revenues should be a warning sign that all is not well in the economy. The habit of measuring economic well-being in terms of the Dow Jones or home prices — as the Trump administration likes to do — tells us little since rising home prices and stock prices are more indicators of price inflation in the current economy. And, of course, rising home prices largely just indicate that the cost of living is going up. It’s more likely that the lackluster tax data — lackluster from the government’s perspective — illustrates that households and workers aren’t doing nearly as well as we’re being told they are. Janet Yellen, after all, tells us that the economy is doing just swell, and this will allow for increases in the Fed’s target rate. But don’t worry too much about the feds. Even if revenues fall, they’ll be fine because they’ll be able to make up for it by inflating the money supply and through deficit spending. Your household revenues — and thus the tax receipts you produce — may be going down, but the feds will simply go deeper into debt and ignore the problem. Moreover, if we dig deeper into recent receipt data, we find that through the end of 2016, corporate tax revenues fell a whopping 11 percent, which was the largest drop since 2009 — in the midst of recession. Indeed, it appears that much of the recent decline in receipts is due to falling corporate revenue. 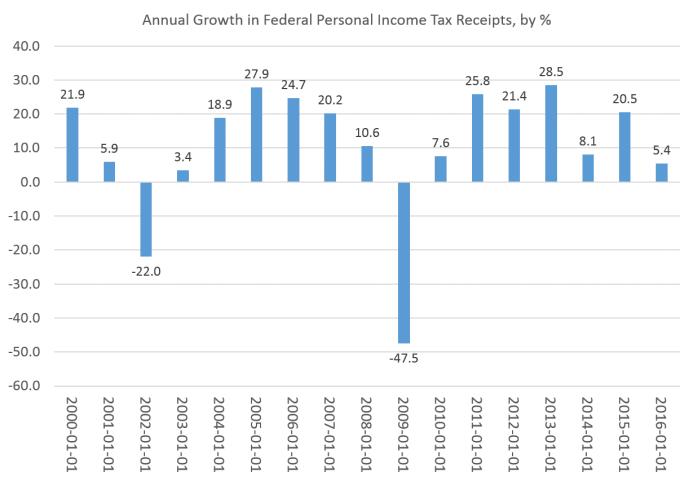 Looking at personal income taxes through 2016, we find that growth in receipts is at the lowest level seen since 2003, in the wake of recession. The quarterly data doesn’t look any better. While we have plenty of measures of how people “feel” about the economy, tax receipts remain one of the more objective measures of earnings. After all, in spite of what some cranks may say, paying federal taxes is mandatory under pain of legal sanctions, and thus provides us with a reliable glimpse into how much revenue people are earning. For most people, when they earn more, they pay more in taxes. Last year, a look at total tax returns and personal income taxes paid revealed that wages and salaries went nowhere between 2007 and 2014 (the most recent year available). On the other hand, those who already own lots of inflationary assets — such as stocks, real estate, and fine art — are doing fine. Many others — many who pay the taxes — appear to be doing less well.